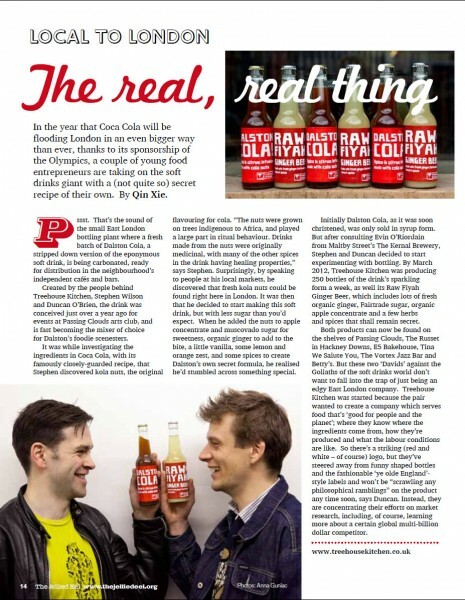 In the year that Coca Cola will be flooding London in an even bigger way than ever, thanks to its sponsorship of the Olympics, a couple of young food entrepreneurs are taking on the soft drinks giant with a (not quite so) secret recipe of their own. By Qin Xie. Pssst. That’s the sound of the small East London bottling plant where a fresh batch of Dalston Cola, a stripped down version of the eponymous soft drink, is being carbonated, ready for distribution in the neighbourhood’s independent cafés and bars. Created by the people behind Treehouse Kitchen, Stephen Wilson and Duncan O’Brien, the drink was conceived just over a year ago for events at Passing Clouds arts club, and is fast becoming the mixer of choice for Dalston’s foodie scenesters. It was while investigating the ingredients in Coca Cola, with its famously closely-guarded recipe, that Stephen discovered kola nuts, the original flavouring for cola. “The nuts were grown on trees indigenous to Africa, and played a large part in ritual behaviour. Drinks made from the nuts were originally medicinal, with many of the other spices in the drink having healing properties,” says Stephen. Surprisingly, by speaking to people at his local markets, he discovered that fresh kola nuts could be found right here in London. It was then that he decided to start making this soft drink, but with less sugar than you’d expect. When he added the nuts to apple concentrate and muscovado sugar for sweetness, organic ginger to add to the bite, a little vanilla, some lemon and orange zest, and some spices to create Dalston’s own secret formula, he realised he’d stumbled across something special. Initially Dalston Cola, as it was soon christened, was only sold in syrup form. But after consulting Evin O’Riordain from Maltby Street’s The Kernal Brewery, Stephen and Duncan decided to start experimenting with bottling. By March 2012, Treehouse Kitchen was producing 250 bottles of the drink’s sparkling form a week, as well its Raw Fiyah Ginger Beer, which includes lots of fresh organic ginger, Fairtrade sugar, organic apple concentrate and a few herbs and spices that shall remain secret. Both products can now be found on the shelves of Passing Clouds, The Russet in Hackney Downs, E5 Bakehouse, Tina We Salute You, The Vortex Jazz Bar and Betty’s. But these two ‘Davids’ against the Goliaths of the soft drinks world don’t want to fall into the trap of just being an edgy East London company. 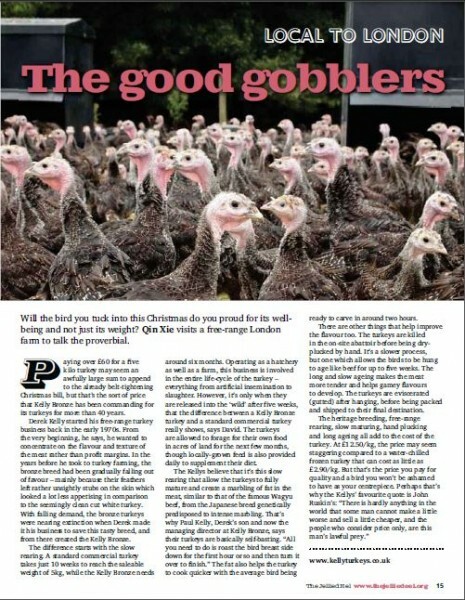 Treehouse Kitchen was started because the pair wanted to create a company which serves food that’s ‘good for people and the planet’; where they know where the ingredients come from, how they’re produced and what the labour conditions are like. So there’s a striking (red and white – of course) logo, but they’ve steered away from funny shaped bottles and the fashionable ‘ye olde England’-style labels and won’t be “scrawling any philosophical ramblings” on the product any time soon, says Duncan. Instead, they are concentrating their efforts on market research, including, of course, learning more about a certain global multi-billion dollar competitor. Tucked away under a converted railway arch is Kappacasein, a café and dairy known for only one thing: cheese. 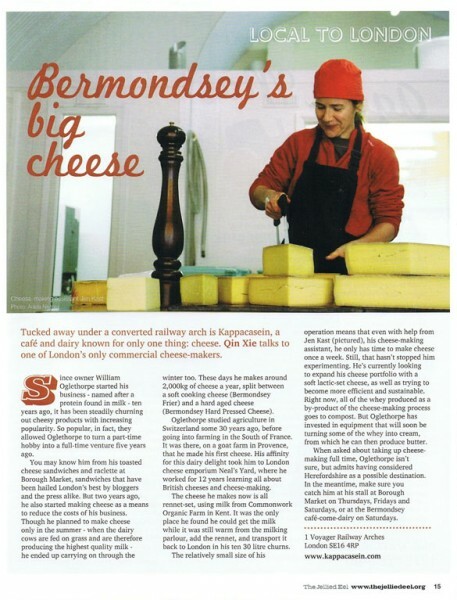 Qin Xie talks to one of London’s only commercial cheese-makers. Since owner William Oglethorpe started his business – named after a protein found in milk – ten years ago, it has been steadily churning out cheesy products with increasing popularity. So popular, in fact, they allowed Oglethorpe to turn a part-time hobby into a full-time venture five years ago. You may know him from his toasted cheese sandwiches and raclette at Borough Market, sandwiches that have been hailed London’s best by bloggers and the press alike. But two years ago, he also started making cheese as a means to reduce the costs of his business. Though he planned to make cheese only in the summer – when the dairy cows are fed on grass and are therefore producing the highest quality milk – he ended up carrying on through the winter too. These days he makes around 2,000kg of cheese a year, split between a soft cooking cheese (Bermondsey Frier) and a hard aged cheese (Bermondsey Hard Pressed Cheese). Oglethorpe studied agriculture in Switzerland some 30 years ago, before going into farming in the South of France. It was there, on a goat farm in Provence, that he made his first cheese. His affinity for this dairy delight took him to London cheese emporium Neal’s Yard, where he worked for 12 years learning all about British cheeses and cheese-making. The cheese he makes now is all rennet-set, using milk from Commonwork Organic Farm in Kent. It was the only place he found he could get the milk while it was still warm from the milking parlour, add the rennet, and transport it back to London in his ten 30 litre churns. The relatively small size of his operation means that even with help from Jen Kast (pictured), his cheese-making assistant, he only has time to make cheese once a week. Still, that hasn’t stopped him experimenting. He’s currently looking to expand his cheese portfolio with a soft lactic-set cheese, as well as trying to become more efficient and sustainable. Right now, all of the whey produced as a by-product of the cheese-making process goes to compost. But Oglethorpe has invested in equipment that will soon be turning some of the whey into cream, from which he can then produce butter. When asked about taking up cheese-making full time, Oglethorpe isn’t sure, but admits having considered Herefordshire as a possible destination. In the meantime, make sure you catch him at his stall at Borough Market on Thursdays, Fridays and Saturdays, or at the Bermondsey café-come-dairy on Saturdays.